Red Palm Fruit Oil is uniquely rich in potent antioxidants, as well as cholesterol- and trans fat–free: this allows it to help protect your brain, heart, skin, and other organs from disease and aging, as well as boost your metabolism and help reduce stubborn belly fat. Its deep red/orange colour comes from a high concentration of carotenes like beta-carotene (provitamin A) and lycopene, the antioxidants found in carrots and tomatoes, but which occur in red palm fruit oil in much higher concentrations. The body converts beta-carotene into vitamin A, which helps promote a strong immune system and builds good vision. Red palm fruit oil is one of the richest natural sources of tocotrienols and tocopherols (vitamin E) that act as scavengers of damaging free radicals and play a protective role against aging and atherosclerosis. The combination of vitamin E, tocotrienols, carotenes, coenzyme Q10, and other antioxidants makes red palm fruit oil a superantioxidant food. The antioxidant power of this unique oil may help protect against diseases such as osteoporosis, cataracts, macular degeneration, arthritis, and liver disease. Plus, it can help protect the skin from UV-ray damage and premature aging. Also, because red palm fruit oil goes directly to the liver, it not only doesn’t get stored as fat like traditional oils, but it actually helps ignite the metabolism and helps you burn calories from fat much faster. Suggested uses: As is, on vegetables, in salads, spread on bread, for cooking, baking, high-heat frying, etc. No refrigeration required. Naturally thickens to a paste under 21 °C (70 °F). Red palm fruit oil is an excellent source of vitamins A and E. It contains 3 to 6 times more retinol equivalents than carrots, and 40 to 50 times more retinol equivalents than tomatoes (weight for weight). Among all vegetable oils, red palm fruit oil has by far the highest level of naturally occurring tocotrienols (11 mg per 15 ml portion); tocopherols and tocotrienols are two forms of vitamin E, an antioxidant. 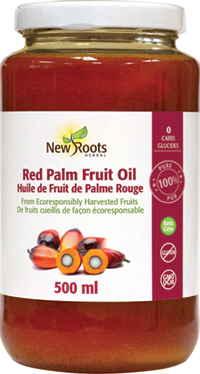 Red palm fruit oil is nonhydrogenated. Contains 1.2 mg coenzyme Q10 per 15 ml portion. No artificial colours or preservatives. Orangutan- and elephant-friendly oil. A buffered form of vitamin C that’s easy on the stomach. ᴅ‑Ribose is a simple carbohydrate molecule found in every cell in the human body.